Since its Christmas, I thought I’d share with you a little bit about some of our family Christmas traditions and ways of doing things… hopefully you may find some tips on how to create a stress free Christmas in here too! I save throughout the year and in the months leading up to Christmas I’m always uber prepared, by buying and wrapping gifts and writing out cards well in advance; I’m certainly not a Christmas Eve shopper! I’ve got into the habit of wrapping as I buy… that way when I have children, at least if they find their gift before Christmas, they wont know what it is! I buy a lot of presents online, like DVDs Play.com, and I tend to order these in October, thus avoiding our lovely friends Royal Mail from failing to deliver before Christmas (yes, I am doing my bit for the postie!). With regards to the food and alcohol over Christmas, I don’t go over board. Of course, I buy the indulgences that we enjoy but realistically the shops are only closed for one day and I often look at those dashing around Asda with two trolleys and think really? Is that necessary? I buy all of my frozen and picky food, as well as any non perishable items and alcohol a few weeks in advance and store it so that I only have meat, fish, vegetables and perishables to buy in the week leading up to Christmas. I either order our turkey and other meats from the likes of M&S or go to a local butcher and we get our vegetables from the local greengrocer… this means that when I go to Asda a few days before Christmas while everyone is running around like headless chickens, I stroll in with a basket. 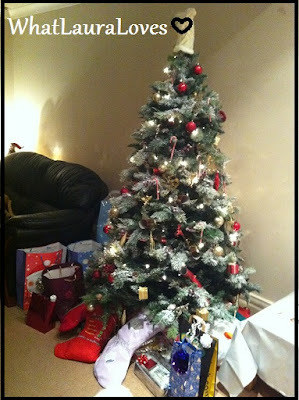 I like Christmas to be stress free and to me, its more about enjoying myself with friends and family than the presents. We always make a point of catching up with loved ones and having parties. Every year we go to see a pantomime at some point over the festive period. I love going to the Customs House in South Shields. Its a little bit of a drive from where I live now but it truly is the best place to see a panto. I think there are more jokes in it for the adults than the kids! We tend to put our tree up during the first week of Christmas and yes its fake, with spray on snow! Although I know that a real tree is, well, real I think an artificial tree looks more real if that makes any sense. They’re just more full and prettier I think… plus its much less hassle than having to go get a real one. I just couldn’t be chewed on with that! Mr WhatLauraLoves and I love watching films around Christmas time. Our genre of choice is thriller and horror but of course, we enjoy Christmas films during the festive period. Our faves are Jack Frost, The Grinch, Elf and The Holiday. I like to be at home on Christmas Eve and Christmas Day. I’ve tried going out for meals and even on holiday for Christmas but it just isn’t the same as being at home. Don’t get me wrong, waking up on an island in the Maldives was beautiful but it just wasn’t the same. I’m a creature of habit and I don’t like change. In the days leading up to Christmas, me and Mr WhatLauraLoves always go to Lush and choose a bath ballistic for ourselves and my dad and then on Christmas Eve we all open our stockings with our Christmas bath bomb, new PJs, slippers and chocolates in. This year my dad had Abominable and Mr WhatLauraLoves and I had Golden Wonder. We often go to the Christingle at the church I was baptised in and then we come home, have dinner with picky foods and then we each have a bath with our treat from Lush and put our Christmas jarmies on. Whilst I am well aware that Santa *shudders* isn’t real, I always make sure I’m in bed before midnight otherwise, I tell myself, he wont come! On Christmas morning, I always run downstairs asking if HE’s been and then we all sit around the Christmas tree opening presents. I don’t tend to do much on Christmas day. I like to stay in the house in my jarmies all day. We used to have salmon as a starter and then our turkey dinner mid afternoon but it was just too much. Now we have salmon with salad at noon and then our Christmas roast dinner at around 6pm followed by sticky toffee pudding and cream, not particularly festive but we aren’t fans of Christmas pudding! So that’s about it, our Christmas traditions and what we get up to leading up to Christmas. Do let me know your Christmas traditions or tips for a stress free Christmas in the comments box. I love reading about how other people do things and getting tips from them and perhaps some new traditions to start!